Hundreds arrive at community of Har Bracha in Samaria for funeral of Itamar Ben Gal, father of 4, murdered yesterday in Ariel. The funeral of Rabbi Itamar Ben Gal is taking place at this hour, Tuesday, In the community of Har Bracha. Ben Gal, father of four, was murdered yesterday in a stabbing terror attack at the entrance to the Samaria city of Ariel. The funeral includes the attendance of Knesset Speaker Yuli Edelstein, Minister Uri Ariel, MKs, rabbis, and friends. Rabbi Eliezer Melamed, Rabbi of Har Bracha, tearfully eulogized Rabbi Ben Gal and consoled the family. Rabbi Melamed called on the government to expand Har Bracha and to continue building the Land of Israel. "The Land of Israel and the World to Come are acquired through sufferings," Rabbi Melamed said, quoting the Talmudic dictum. "You, Rabbi Itamar, merited to fulfill them with your body. You had not yet reached the age of 30 but you still managed to weave great dreams. In the few years that you served as a rabbi, you succeeded in inspiring your students. You were always ready to volunteer for holy matters, you loved your students at the yeshiva in Givat Shmuel. We were sure that, as a natural leader, you would be a yeshiva head, and now all the dreams are lost. And it is rare to see a man that so values and honors his parents," Rabbi Melamed added. Knesset Speaker Yuli Edelstein said in his eulogy, "A pious man has been lost, we have lost Rabbi Itamar, who devoted his whole life to education and lit up the world with kindness. Together with you, Miriam, he established a wonderful family, and I am sure that you will continue in your love of Israel." "The lowly terrorist who sneaked behind Rabbi Itamar did not know him and did not know in whom he was embedding a knife, but anyone who knows Itamar knows what the terrorist must have seen. He saw the light. They say that an assailant acting alone is just a murderer, but it's not a random act here. He wanted to take away the glow,the smile. That is the desire of our enemies, to wipe us from the Land. The murderers of Rabbi Shevach hoped to destroy settlement in Havat Gilad. The murderer of Itamar wanted to extinguish the light here, and in Itamar's eyes, but they won't succeed." Miriam Ben Gal, the widow of Rabbi Ben Gal, said on Monday night, "This afternoon I lost my husband over the land of Israel, he was murdered because he is Jewish. I am here in my home, in the home to which he will no longer return. Tomorrow we will bury him here at Har Bracha, in the community he loved and wanted so much to develop." 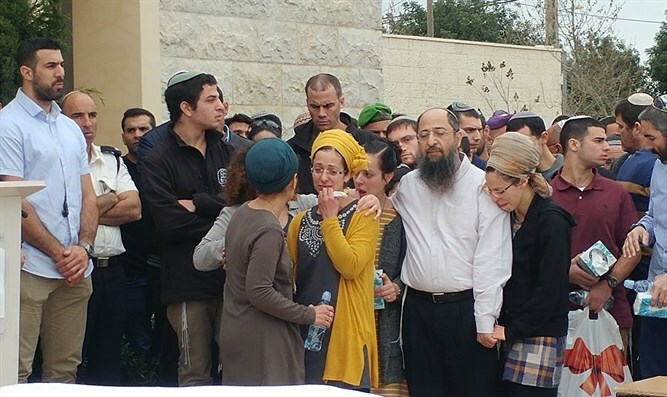 Yael Shevach, the widow of Rabbi Raziel Shevach, who was murdered in a terror attack nearly a month ago near the community of Havat Gilad, yesterday posted on her Facebook page, following the murder of Ben Gal: "I never thought that I would feel that a sister had been born to me. Miriam, I embrace you, my dearest. We will get through it. Together. Alone."